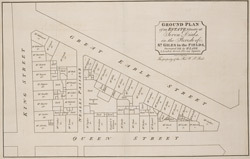 This plan covers the area of the Seven Dials, a street formation of seven streets radiating from a central point. Thomas Neale, Master of the Mint began the development of the complex in 1693. The project was completed around 1710. In 1694 John Evelyn went to see the building work and commented on the star formation radiating from a point marked by a Doric pillar. This pillar was removed in 1773 as it had become a meeting place for criminals, partly due to a false rumour that a large sum of money had been buried at its base. Although intended as a smart residential area, it became the haunt of thieves and street vendors in the 18th and 19th centuries. The building of Shaftsbury Avenue and Charing Cross Road reduced the area to little more than a junction.